Her husband wanted to die at home, but she couldn’t handle being a caregiver and put him in a nursing home. Fortunately, we could afford nursing home care for my step-dad and we could afford 24/7 care for my mom at home for her last month with family rotating in from the other coast. It was still exhausting for everyone. When my wife and I discuss end-of-life and I filled out paperwork about my wishes, I emphasize care at home. Now I realize that is selfish. I don’t want to burn my family out. The same burden my mother worried about. If they need to put me in a nursing home, I’ll deal with that. My friend @SterlingHIT forwarded this Huffington Post article with cringe-making facts about caregiving. The article highlights that spousal caregivers and those who provide care in their home have it the worst. These 34 million caregivers save the country $500 billion annually in caregiving cost. How do we care for our caregivers? I meet many caregivers. After I hear their often very long stories, I ask how they take care of themselves. The answers are markedly shorter. 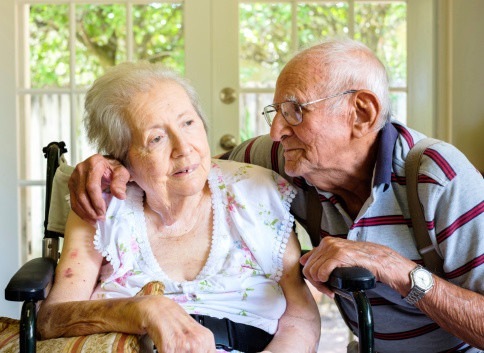 They seem much more invested in caregiving others than themselves. Tremendous stress results. My friend Chris Gordon, a psychiatrist extraordinaire, talks about pocket therapy. Something in your pocket you can take when your self-help strategies fail you. He says that most times, people don’t need it. It’s enough to know it’s there. My pocket therapy, living with a progressive chronic illness is Ativan. I take it rarely. What can we do for caregivers so they don’t need their pocket therapy? If we treated our veterans better, I’d say treat caregivers like veterans. We owe it to them. But we don’t treat our veterans very well, so that’s no model. Where are our priorities and values? Pay now or pay later. Your post made me reflect back to caring for two parents, both with the assistance of Suncoast Hospice, in their final months. The one thing I took away from my experience is that they were hard but, in many respects, an opportunity for me to grow and feel rewarded for what I learned about myself in the process. The other value for me is that I always thought I had terrific siblings and the experience proved that for me. Our family grew much closer together and, now that we are all getting older, talking about death is not a challenge for us. Looking back, I would do it all over again, but I do realize that since, in both case, I only spent four months with them, the story might be different if there was a much longer time required. So, yes, keeping one’s options open makes sense. Danny, when you referenced pocket therapy at Health 2.0 it was so applicable for me in that particular moment in time. The Silicon Valley in all its glory left me in personal need of some pocket therapy 🙂 Although I dont carry medicine, I do carry specific items to either provide a connection to people I love or to ground me in perspective. So on the day I presented at Health 2.0 I was wearing a bracelet given to me by a little girl who committed suicide, my grandmother’s wedding ring, a necklace given to me by a dear friend, 3 rocks in my pocket from places I love and a small tattoo on my neck that reminds me when “Fate says to the warrior you can not with stand the storm.. and the warrior whispers back I am the storm” I didnt realize until after we lost the contest that I needed every bit of my pocket therapy. I was really fine with the contest and had been pretty sure that we wouldn’t win. It didnt hit me until a few hours later, when my CICS kids and families and staff checked in to see if we won. I had to tell them no and the moment I felt their disappointment it was like a wave of sorrow washing over me. My kids and families don’t often have a lot to get excited about. Hope is a precious and rare gem in our lives together. And yet hope is what we do best. Hope that being understood by others changes things. Hope that understanding yourself changes things. Hope that medicine and science will provide solutions. Hope that things will get better. And in my enthusiasm to tell people about what we do, I forgot that their hope travels with me. I will be more careful in the future in terms of what I invite them into. I sure did rely on my pocket therapy to get through that day. As well as your smile and waving hands and hug. Which were in fact the best therapy of all. I recently completed training to be a hospice volunteer. I think I will learn a lot about myself in the process of caring for others. Also, I expect it will help me refine my own wishes for end of life care. I had major surgery 7 weeks ago and prior to hospitalization I registered my Advance Directive / Living Will. I can’t get my husband to do the same, ‘though. Your blog often raises issues I need to think about. Thank you, Danny, for your compassion and sharing.